In March, even without the influx of freshwater, the fish spread out. 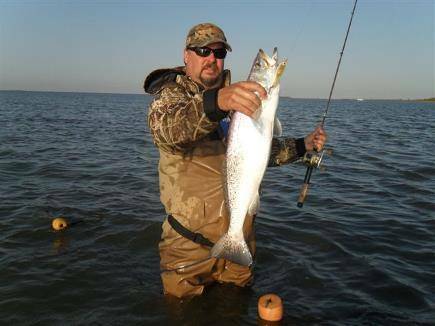 Some of West’s favorite spots to check out are the north and south shorelines of East Bay and the shorelines of upper Galveston Bay. In Trinity Bay he likes the Kemah Flats and Sylvan Beach area (29.546283, -95.0108). Don’t forget to check out Burnett Bay (29.76856, -95.05077) and Tabbs Bay (94.866667, -94.94236). In March West’s usually throws a Corky or a MirrOdine by MirrOlure, and sometimes the 51 series MirrOlure as the water warms.